You can convert many different image file formats in Mac OS X for free using the included Preview application, there’s no need to download additional tools or do anything overly complex. As of any somewhat modern version of OS X, the Mac Preview app supports the following file types and will convert between any of them: GIF, ICNS, JPEG, JPG, JPEG-2000, Microsoft BMP, Microsoft Icon, OpenEXR, PDF, Photoshop (PSD), PICT, PNG, SGI, TGA, TIFF. Some of those image formats will be hidden from your default view when saving, requiring the usage of the “Option” key when saving to reveal them. In any event, converting from one image type to another is simple. You can repeat this process with other image files as necessary. The above process will hold true regardless of the origin images file format and the desired file format. Preview.app supports a wide range of image conversions: GIF to JPG, JPG to GIF, PSD to JPG, JPG to PDF, JPG to BMP, BMP to JPG, BMP to GIF, PNG to GIF, JPG to PNG, TIFF to JPG, and just about every other variation between these and more. As long as the image format is supported by Preview, it will convert it to any other supported file format. It’s a good idea to save your files to somewhere easy to find. Easy as pie. Happy converting! One thing to keep in mind is that if you’re going to be performing an image file conversion of many files to the same file type, let’s say a large group of PNG files that all need to become JPEG, you can perform a batch image format conversion as described here, which is a much faster and more efficient way to handle a large selection of images. 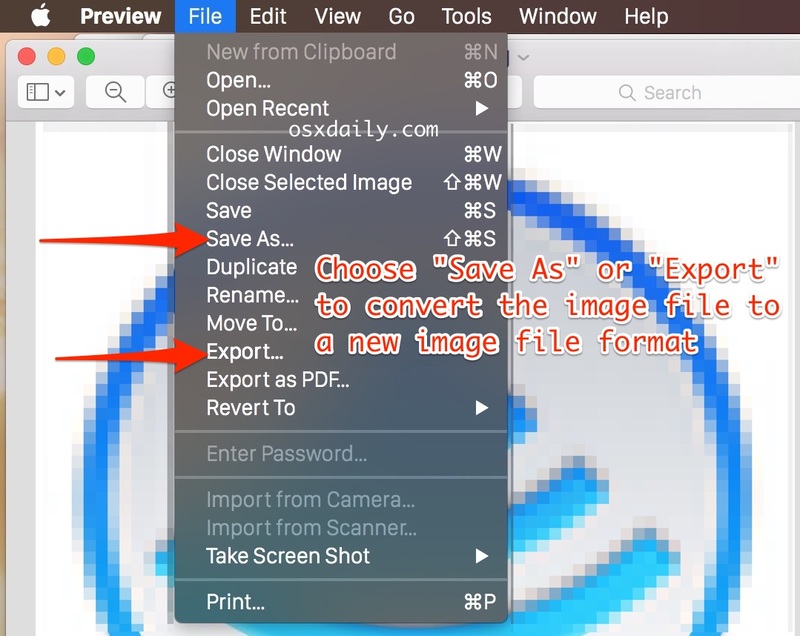 Whether you’re converting a single image file or multiple, the feature exists in all versions of OS X, the only difference other than superficial appearance of the Preview app itself, is whether you will be using the “Export” feature or the “Save As” feature. Modern versions of OS X will have both, which means you can pick either to convert the image to a new format as desired. Useful tip. Preview might be a bit unweildy for batch work but gets the jobs done. I have a whole bunch of images (an album of about 1,000 images) that I need to convert from png to jpg. Is there an easy way to do a large batch like that on a Mac? I know I can open each png image and convert it to a jpg. Do I have to do them all one by one? Is there a better Macs OS X app to convert from bmp to gif? Odds are, the actual file is about the same size. They’re reporting a different measure of space used: Even a one byte file occupies an entire block on the hard drive. Windows is reporting how big the data in the file is, while Mac OS is reporting how much of the hard drive space (one block) the file is using. Also, Mac OS will include the space required for the thumbnail Finder displays along with the image; Windows will hide that space in a different, hidden file. Thank you for the advice. i was able to convert my file easily. I did not even know about the preview app. This doesn’t work. All I get is four target file types: .pdf, .png, Photoshop, and .tif. I tried this but a program that accepts only 24 bit depth BMP’s does not like the 32 bit depth put out by Preview or in slides saved as BMP from Powerpoint. How to change the bit depth from 32 to 24 bits? All this is meaningless if you use OSX10.4.11, like me. Any suggestions for this ‘ancient’ OS? This is what i am doing, but i have to do around 100 files, its quite tedious doing it one by one, and highlighting all the files and doing this doesnt seem to work! Run automator.app, it´s in Applications folder. When it asks, select “workflow”. 1. Click “files & folders” on left. From right column drag & drop “ask for finder items” into the left window. Select the folder where your images are, tick “allow multiple selections”. 2. Drag & drop “copy finder items” and select the folder where you want to copy. 3. Select “Photos”, and drag “change type of images”. Select the output format. Save the workflow for possible future use (File, save as). Click run, select the photos to be converted. After a period, You have all the images in the output folder, in another format. 5 years a mac user and didn’t have the slightest idea that you can do that! THANK YOU!!! You saved me a LOT of time!!! Thanks a LOOOOOOOOOOt, Mac friend! I didn’t know either what Automator was for, you save me time and money and I’m definitely going to dive into this great App! Thanks again! Thank you Aske. Automator worked perfectly. Only thing is, I recently installed Photoshop CS6 and under “Change type of images” I can only choose from BMP, JPEG, JPEG 2000, PNG & TIFF. I need to change the format to PSD. Can you suggest how I might do this? How about a way to batch change to png AND change the resolution of the files? I don’t see that option in the Automator tasks even though it can be done in Preview. You can use the ‘sips’ command-line tool, which I personally find easier than firing up Automator. Check out http://straylink.wordpress.com/2009/01/24/os-x-command-line-image-manipulation/ for examples. It will not let me save the files. I don’t know what’s going on. Great tip, must see if we can add recursion to this. Does it work with Lion too? It doesn’t say squat about not providing all formats. Gari, do you have an option for .gif in yours? My older versions of Mac had that extension, but Lion doesn’t seem to. If not, is there a way to add extension options? Would anyone venture to say this app is as good or better in some things than Gimp. I researched it and it looks like there were no issues for OS X 10.6 or later. You have to hold alt (option) key when you click on the file type to expose hidden types like gif, icns, etc. Thank you Luis L… I was desperate and you gave me what I was looking for : an ANSWER :) Couldn’t understand why some file type had disappear. Now they’re back thanks to you. WHEN YOU CLICK ON THE FILE TYPE! Not when you click “File” in the Preview control bar. Not when you click “Export File”. When you click ON THE DROPDOWN MENU TO CHOOSE A FILE TYPE TO EXPORT TO. Sheeeeeesh! You probably got the answer straight over 4 years ago, but here it is anyway. That’s WHEN YOU CLICK ON THE FILE TYPE! Not when you click “File” in the Preview control bar. Not when you click “Export File”. When you click ON THE DROPDOWN MENU TO CHOOSE A FILE TYPE TO EXPORT TO. Sheeeeeesh! i want to convert a large file that is in photoshop to a jpeg file. How do you do it?????? I have gone through all of your steps, is it normal to be waiting a long period of time for the items to be converted during the last step? I have been waiting a good 15 minutes. thanks so much for your explaination ! I am able to convert tiff files to bmp on my Mac. However, I need to convert them specifically to Monochrome bitmap files which so far as I can tell is not an option. Does anyone know how to do this?